Private lender First Investment Bank (FIB) has an exposure of 234 million euro to a single individual associated with its shareholders! After the revelation that current and former employees of FIB manage offshore companies, receiving huge loans from the lender, Bivol managed to also unravel the ownership of these companies. One same person, named Georgius Georgiou, is behind YULEN, VITOSHA SKI, and the firms that bought the Kremikovtsi steel mill near Sofia and the Lead and Zinc Complex (OCK) in the southern city of Kardzhali. Bivol’s investigation established that Georgiou is both a debtor of FIB and a person controlled by its main shareholders, Tseko Minev and Ivaylo Mutafchiev. Documentary confirmation of connectivity between Minev and the ski-concessionaires of the Pirin and Vitosha mountains that for years enjoyed preferences by the State is made public for the first time as well. So far this dependence was discussed as an open secret, but the evidence was rather indirect. 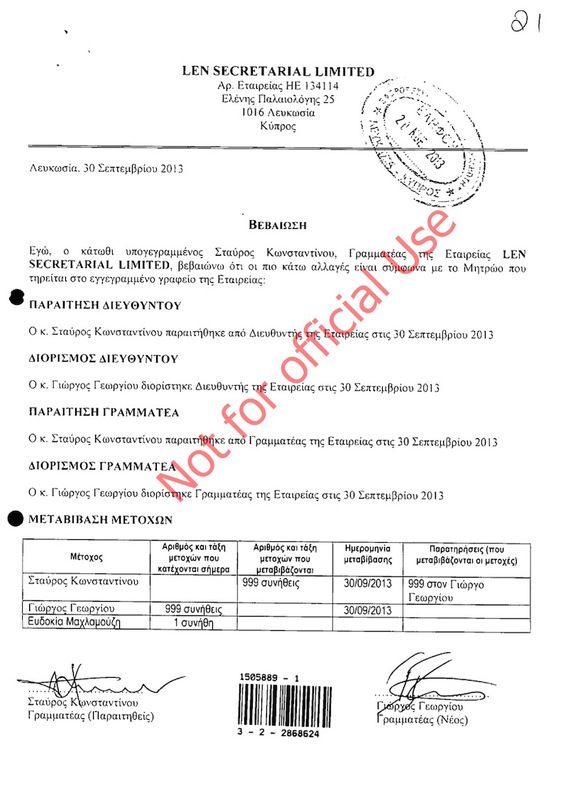 On December 3, 2013, two Cypriot offshore companies, owned by George Georgiou, sold their shares in LEGNANO ENTERPRISES to Tseko Minev and Ivailo Mutafchiev, shows a document from the Cypriot trade registry. The shareholders of FIB bought from Georgios Georgiou the shares of a Cypriot company which is also a FIB shareholder. Click on the diagram to enlarge it. – Georgiou is the Director of an offshore company that owns 100% of VITOSHA SKI JSC. The property there, according to the latest available data, belongs to his namesake Stella Georgiou. She owned in the past a company, which is now owned by Georgiou. 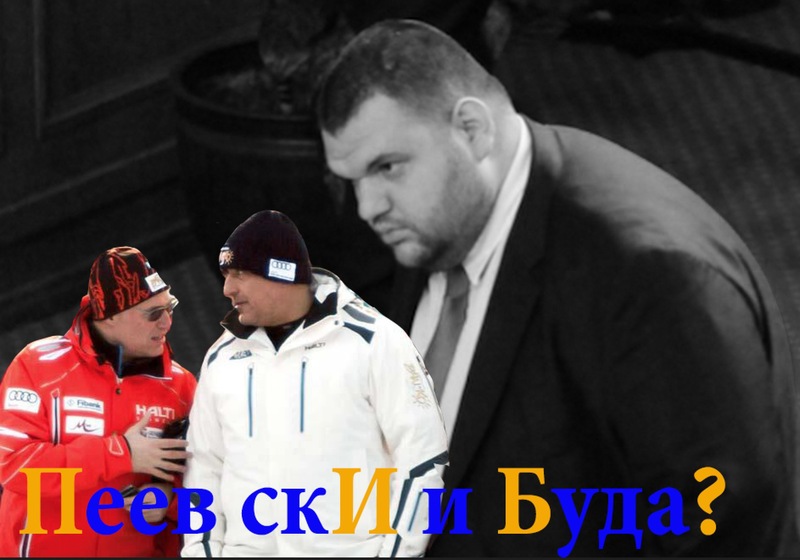 So it turns out that the Head of the Ski Federation Tseko Minev and his partner Ivaylo Mutafchiev (agent “Kamen” from the Communist secret service, the State Security, DS) control the owner of YULEN, who is the manager of their company. And that same person has control over VITOSHA SKI. The concessionaire of the ski resort in Bansko, YULEN, is owned by the Cypriot MARENGO TRADING (60%) and T.A.K. SERVICES (27%), registered in the British Virgin Islands. 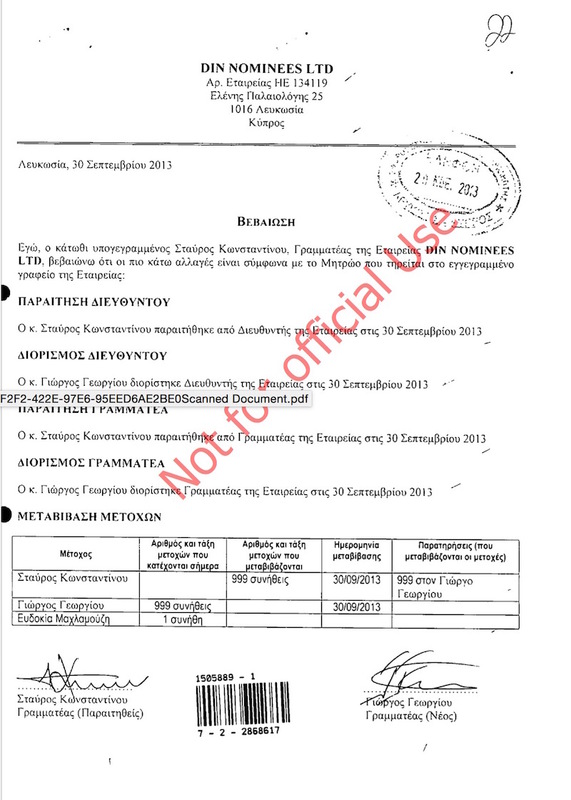 The owners of MARENGO are the Cypriot companies DIN NOMINEES and LEN SECRETARIAL with 50% each (see here). Exactly those two companies sold to Tseko Minev and Ivaylo Mutafchiev the shares in LEGNANO ENTERPRISES. In turn, DIN NOMINEES and LEN SECRETARIAL are owned by Georgios Georgiou with 99.9%, while 0.1% is held by Evdokiya Maklamuzi (see here and here). T.A.K. SERVICES is owned by DUC NOMINEES, which is also owned with 99.9% by George Georgiou and with 0.1% by Evdokiya Maklamuzi (see here). The connection of Tseko Minev and Ivaylo Mutafchiev with Yulen JSC is through Georgios Georgiou, who is the Director of their company and owner of the offshore companies owning Yulen. Click on the diagram to enlarge it. VITOSHA SKI JSC is 100% owned by ELLORA MANAGEMENT LTD., in the British Virgin Islands, which directly controls 67.12% of the shares and another 32.88% through ALEKO SPORT 99 (see here). The company has a credit line of more than 4 million levs from FIB. According to documents, the owner of ELLORA is Stella Georgiou, born in 1952. The Director of ELLORA is Georgios Georgiou (see here). 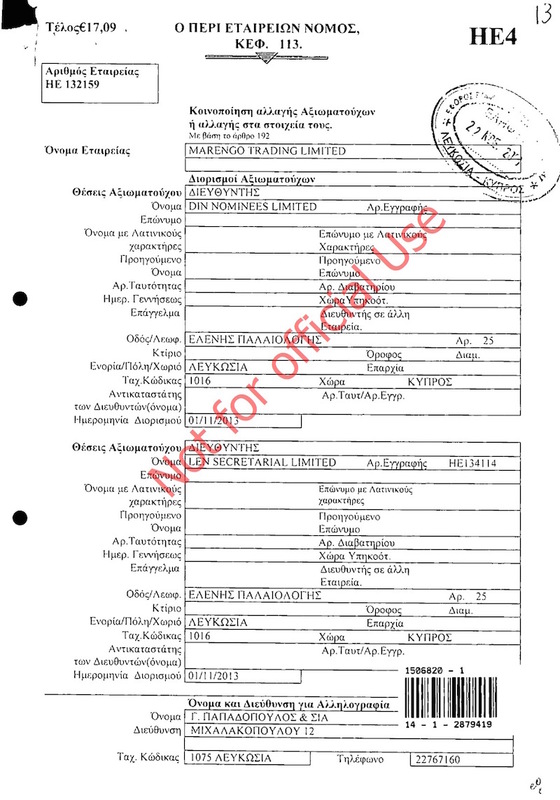 The listed company secretary is the Cypriot NORMAL SECRETARIAL (see here). It is also owned by Georgiou (see here). Georgios Georgiou’s control spreads over Vitosha Ski. Click on the diagram to enlarge it. The current director of LEGNANO, Georgious Georgiou, proved to also be the final ownership of other offshore companies that have received huge loans from FIB to buy the insolvent Kremikovtzi and the OCK. The fate of these socialist behemoths ended ingloriously with their sale as scrap and second hand machinery. 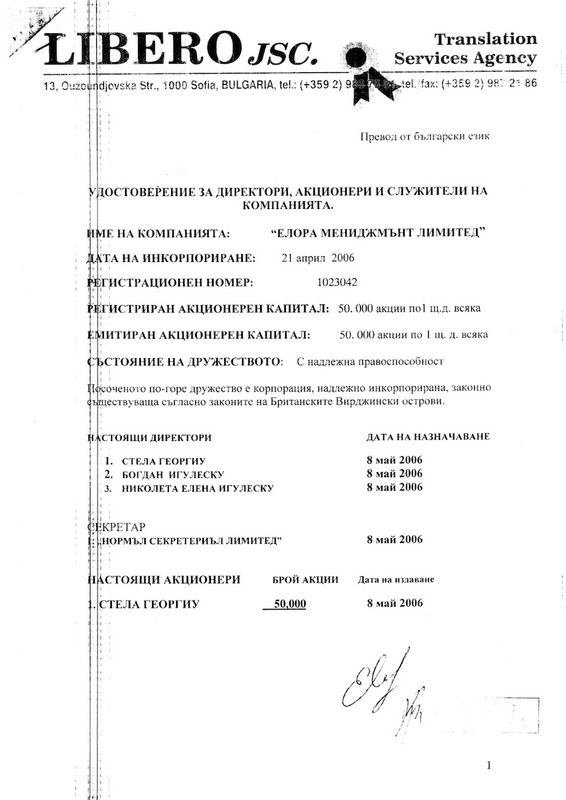 In a previous investigation Bivol proved that the borrower companies are managed by current and former employees of FIB. DUC NOMINEES (which owns T.A.K. SERVICES and through it YULEN) owns BESSION MANAGEMENT (see here), which owns the ELTRADE COMPANY, one of three companies that have received multi-million loans in euro from FIB to buy Kremikovtzi (see investigation in the loans here). As already mentioned, DUC is owned by Georgios Georgiou. The other two companies – VALPET CONSULT and NADINE METALS TRADE – are also owned by Georgiou – VALPET through offshore companies SPICATA CONSULTING and the already mentioned FORMAL NOMINEES (see here) and NADINE trough TOLEDO ASSOCIATES and DUC NOMINEES (see here). Furthermore, Georgiou holds through FORMAL NOMINEES (see here) the offshore HARMONIES HOLDINGS LTD (see here), which owns HARMONY 2012 that bought with a loan from FIB the remnants of OCK Kardzhali. So far, four Cypriot companies, concentrating ownership associated with FIB, can be seen on the radar – DUC NOMINEES, DIN NOMINEES, FORMAL NOMINEES and LEN SECRETARIAL. Over the years, they have had different owners. Maria Papadopoulou, born in the distant 1927, was the owner of DIN and LEN until October 24, 2012, when she sold them to Stavros Konstantinou (99.9%) and Evdokiya Maklamuzi (0.1%). DUC was owned 50/50 by Augusta Papadopoulou and Leniya Papadopoulou until January, 10, 2012, when they sold 99.9% of the shares to Stavros Konstantinou and 0.1% to Evdokiya Maklamuzi. FORMAL has a more interesting history. Since 2004, it belonged to Stella Georgiou, which now is the documented owner of VITOSHA SKI JSC. In early 2008, she sold the company to Lenya Papadopoulou, and she in turn sold it on January 1, 2012, to Stavros Konstantinou. This relative variety of dates and people focused in one day on one person – on September 30, 2013, Stavros Konstantinou sold his shares in DUC, DIN, LEN and FORMAL to Georgius Georgiou. Evdokiya Maklamuzi retained her symbolic participation with 0.1% in DIN, DUC and LEN. The full picture of the links between Tseko Minev, Ivaylo Mutafchief, Georios Georgiou, Yulen, Vitosha Ski, Kremikovtzi and OCK is still too complicated, but formally traceable. Click on the diagram to enlarge it. The almighty Georgiou was behind the offshore company GOFF HOTELS MANAGEMENT through his company BUN SECRETARIAL (see here). In the previous investigation of Bivol, it became clear that GOFF received from FIB assignments of debts of insolvent companies. On this day, Georgiou made a very controversial investment. He acquired the ski facilities in Bansko through YULEN (87% of the total capital of 76,470,000 levs) plus the remnants of Kremikovtzi through ELTRADE (100% of the 20,000 levs), NADINE (100% of the 20,000 levs) and VALPET (100 % of the 5,000 levs) and to top it off, the remnants of OCK Kardzhali through HARMONY 2012 (100% of the 5,000 levs). On the other hand, Georgiou also acquired the debts of NADINE, ELTRADE, VALPET and HARMONY to FIB for a total of 234.6 million euro. These four large exposures are nearly six times more than the capital of his companies in Bulgaria. And for FIB, which should receive its money back from one same person, moreover a person connected to its shareholders, the amount is over 70% of its own equity and capital. Indeed, on December 3, 2013, Georgiou managed to sell to Minev and Mutafchiev his shares in LEGNANO at an unknown price and maybe he has somewhat managed to mitigate the damage. On the other hand, all his enterprises in Bulgaria, acquired through offshore companies, are at a loss. The scrap from Kremikovtzi obviously cannot repay the investment. It seems that OCK Kardzhali may not be used even for scrap. The only functioning equipment there is the truck scales, which brings a small income. Whether the said Georgiou will be able to repay the money to FIB or at one point the loan will be written off as unrecoverable? This is a 900-million levs question. This is what is left from the State aid of 1.2 billion given to FIB from the budget. After careful “examination of the 20 largest exposures of FIB”, as claimed by the Central Bank, this aid was approved by the European Commission. BNB should be aware who is Georgios Georgiou, born on April 29, 1971, living in a modest apartment in the suburbs of Nicosia and how to guarantee his solvency and reliability. BNB should be also aware why instead of paying their debt to FIB, Leniya, Maria, Augusta, Evdokiya, Stavros and Georgios took from their Bulgarian companies unsecured loans for their Cypriot companies in the amount of 65 million levs and how they intend to repay them (see Bivol’s investigation Bivol here)? 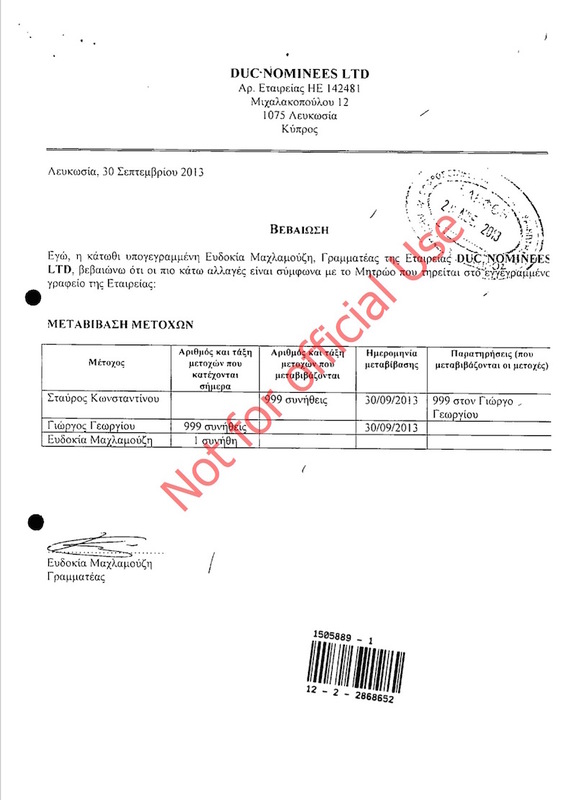 Documents from the annual accounts of NADINE, ELTRADE and VALPET from 2013, which show that they have credited the parent offshore companies. It is possible that BNB is really unaware what the real situation is, if it was misled by FIB and in turn misled the European Commission that everything is fine with the above four large exposures. But how come the banking supervision has failed to detect the apparent connected parties at both the management and ownership level of the companies that have received the loans? And the most important question is WHY BNB refuses to verify the exact facts and documents which Bivol officially submitted to it, if it is not aware of them? We therefore assume that it is aware and therefore simply has nothing to verify in matters which were previously known to it. If we assume that Leniya, Maria, Stavros and Georgios are not some unknown in their homeland multimillionaires and stable investors in doomed Bulgarian enterprises and in ski resorts, but are just dummies, the puzzle with the offshore companies can acquire a very sinister dimension – a dimension of a well and successfully implemented draining scheme with the active inaction (assistance) of “responsible” institutions. After the failed private lender Corporate Commercial Bank (CCB of KTB), such a scenario, to put it mildly, would not be healthy for the State. Upon receiving these data, Bivol fulfilled its civic duty and promptly alerted BNB, which refused to examine them. That is why Bivol cannot remain indifferent and stop asking questions that rather than receiving reassuring answers are greeted with tense silence and overt institutional pressure against the media. The prosecution has also been notified. Currently, the latest attempt to change the management plan for Pirin Park is underway in order to fell it and turn new areas around Bansko, Razlog and Dobrinishte into private ski and golf resorts. Its initiator is YULEN itself and the construction company Balkanstroy. In addition, of being considered close to GERB, this company is a partner in a consortium for the water cycle of the city of Sliven of the linked to notorious lawmaker Delyan Peevski company Vodstroy 98, while Peevski, after “exterminating” KTB, transferred his corpulent business to FIB. The pressure to build in Pirin is monstrous and was renewed sharply with the coming to power of the second government “Borisov”. The firms are handing “talking points” to municipalities and the lobbying for the projects takes place at all levels of power, connected companies and circles of influence. The new zones in National Park Pirin slated for ski facilities are colored in orange and yellow. Yulen’s zone is in blue. The situation appears more than scandalous to the international community. There is no probe or official rebuttal that FIB is not being drained by its owners to finance pharaoh construction projects that are destroying global natural heritage. On the contrary, with the full cooperation of the “State”, billions from the pockets of the poor Bulgarian taxpayers are being poured in the “bad apple”. BNB assures the European Commission that all is well. One day, the truth will inevitably emerge, regardless of the total disgraceful media and institutional censorship. However, the victims will be again all of us, Bulgarian people. Two years ago senior GERB party members and lawmakers openly supported a “counter-protest” in favor of building facilities in Pirin.